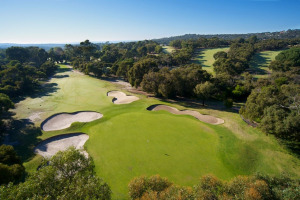 The Anglesea Golf Club is situated on the Great Ocean Road and is a 6,074 metre, Par 73 layout set in natural bushland. A feature of the course is the number of elevated greens that require plenty of thought when selecting your club. There are only 42 bunkers throughout the course and coupled with eucalypt tree lined fairways they combine to produce a stimulating round. Another well known feature of this course is the ever present resident population of Eastern Grey Kangaroos. The kangaroos generally come down towards the Clubhouse of an evening so visitors having a drink on the balcony or dining in the bistro have the unique experience of seeing Australian Wildlife in a natural setting.